The awful year in 2018 endured by the railways might have been leavened somewhat had Crossrail opened on time. In reality, that was never going to happen. While working on my book, The Crossrail Story, over the first half of last year, I was frequently in the Crossrail offices in Canary Wharf and I could see that behind the promises that the scheme was ‘on time, on budget’, there were severe doubts among the senior executives that the December 9th deadline would ever be met. The resulting delay, with an opening date still not announced, was therefore inevitable and has now become the subject of a major row between the London Mayor, Sadiq Khan, and the recently departed chairman of Crossrail, Terry Morgan. There certainly seem to have been some crossed wires between Crossrail and the mayor during the summer when Morgan claims that he made it very clear that the December deadline could not be achieved. He did not, though, quite spell it out in words of one syllable and there were some shenanigans by the mayor’s team in an apparent effort to hide the bad news from Khan. It is an unseemly row and damaging for both sides. Certainly, there seems little that Morgan did wrong except to be the messenger but politics, as I know only too well personally, is a tough game and a project as huge as Crossrail is never going to escape the attention of the politicians. There had to be blame somewhere, and it was not going to be the mayor who takes the can. In fact, there is some justification in that respect. The Tory politicians who lay into the mayor over the delay to the project are being disingenuous. This is not a matter of party politics (I would be saying the same if it were, choke, Boris Johnson still at the helm). The mayor, whoever he or she is, has very little control over a project such as Crossrail once it is underway and consequently should not bear the blame – or indeed the credit. In reality, this row over ‘who know what when’ is a proxy for the far more important question of why Crossrail has been delayed and ended up needing a bail out £1.4bn – or thereabouts, because we don’t know what the final figure will be. The new chief executive, Mark Wild, gave a detailed account – though it did beg some questions – in early January to the London Assembly and I have had the benefit of talking to a few insiders which provides a few bones to chew on, if not the full meal. The first major cause of delay was the late commissioning of the trains. This was because the original idea of purchasing them through a Private Finance Initiative deal, like with the Thameslink trains, was thankfully scrapped. However, this caused about a year’s delay and the procurement process was the responsibility of Transport for London although subsequently, there has been a bit of a blame game over this issue. And here’s the rub. The trains, which are running in shortened formation on the Shenfield line out of Liverpool Street, may look like the finished job because the hardware is complete. However, software in trains these days is far more complex than the moving bits and consequently the source of most problems. The trains running on the network at the moment are unable to run through the tunnels because they do not have the requisite software. Secondly, there is no doubt that the explosion in a transformer in November 2017 set back the testing regime and consequently the whole project. At the time, Crossrail minimised the impact which was ultimately far more severe than originally stated. This did help to create a culture where the openness that had previously characterised the project changed. The way that a project that was supposed to be 93 per cent complete in the spring turned into one that is a year or more late suggests that some in Crossrail had their heads in the sand. As, during that time, I wandered around the Crossrail offices talking to the senior people, who were all very impressive people, and to various outsiders, there was this mantra about ‘on time on budget’ but clearly most of them did not believe in it. The conviction that it would be all right on the night was not credible. Hubris was clearly in the air. Starting to let people go such as the chief executive Andrew Wolstenholme, and running down the team, while also preparing for the big launch on December 9th were clearly all mistakes and given Wild’s statement that people have to be taken back on, will contribute to the extra cost. Thirdly, as I have written before, it is the sheer complexity of the task that has led to delays. An interesting article in London Reconnections highlights how risk accumulates. If you have half a dozen systems each with a 5 per cent risk of being delayed, the chances of a delay to the opening of the whole project are in fact around a quarter. But double that in each case to 10 per cent, and the total risk goes to around a half. Perhaps as an example of this, at one stage the Crossrail team, anxious about the testing for the operation of trains in the main tunnels, prioritised achieving that at the cost of taking effort away from the previous stage, which was running the trains through to Heathrow from Abbey Wood. It proved to be the wrong thing to do, but that is with the benefit of hindsight. In fact, Crossrail was nowhere near opening in December. 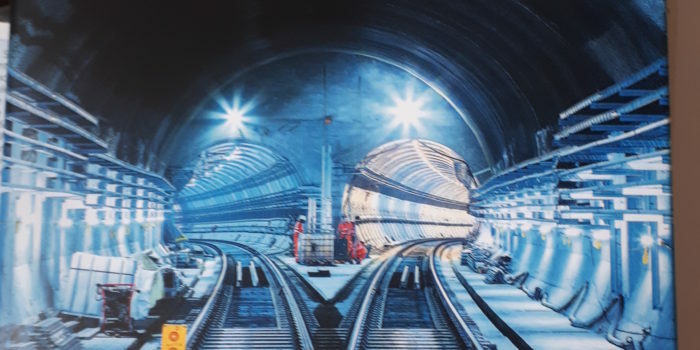 While of the stations were almost complete while others were clearly nowhere near ready and still require, today, months of work, and it has only been in the last week or so that two trains have been running in the tunnels simultaneously. And in a rather oddly worded statement, Wild told the London Assembly that the trains were OK running Westbound out of Westbourne Park, which is where the location of the crucial interface between the TPWS and CBTC signalling systems, but left unstated that they could not go into the tunnel easily. At least now there is a much greater culture of openness and that is reflected in the fact that no opening date has been given. As a betting man, I will would put money on February 2020 – add that to the Mystic Wolmar list. It is strange that the country with the largest network of railways in the world does not understand them or exploit them to the full. About half of the USA’s peak mileage of 250,000 miles (in 1915) survives today though, of course, most of it is entirely devoted to freight. The passenger trains were phased out in the post war motoring boom, apart from in the North East corridor and the long distance Amtrak trains retained for political purposes. Arriving at Baltimore airport for a conference in Washington 40 miles away, I discovered there was a free shuttle bus to the Amtrak and MARC (Maryland Area Regional Commuter) station from where there were reasonably frequent trains to the US capital. However, it was not easy to find my way to the right bus or given there was no one at the station to buy the right ticket. The station was like all American stations, a soulless and minimalist construction of bare concrete and filthy staircases. Sure, there are some beautiful concourse areas in the US, like at the Union Station in Washington to which I was headed, but once you go through the ticket barriers, trackside is a neglected area with no retail, no advertising which at least would live up the space, and bereft of any pleasant architectural features. Baltimore’s airport station, however, won the prize for most disgusting US station I have ever been in as I was greeted by a non-functioning lift and had to haul up my heavy case past human excrement in the stair, something which I have never encountered in my numerous travels around India. I was then treated to a wonderful piece of railway competition. The first train that arrived was operated by Amtrak and I assumed that my $7 ticket would be valid. Not so. The very unfriendly guard – they have several on Amtrak trains, a testimony to the strength of their unions – said it would cost $47 to get me to Washington, though the train would be faster as it was non stop. He also said, wrongly, that this was ‘a private train’ when in fact Amtrak is state owned. The MARC train arrived ten minutes later and took us, slowly as there was a blizzard and there were five stops, to Washington where I subsequently discovered that I had been overcharged since ‘senior citizens’ get half price. So on the return it was just $3 50 or £3 for a 40 mile journey. Despite these low prices, many people do not use the train because of the dirty stations, the difficulties of access and the general air of neglect on American trains. They have a lot to learn from Europe.